Learn how to change a Lexmark printer cartridges with the steps below. In this case we will present how to remove printer cartridges for Lexmark printers Lexmark X2670 all in one; Lexmark X4610; Lexmark P6350 Photo All in One; Lexmark X6160; Lexmark X6130; Lexmark 7310; Lexmark X8310, these cartridges are not as simple to remove them from the printer as the other that only we press down and out, for example removing cartridges for Canon printers with these cartridges we have to do a series of less complex procedures but if they can be difficult at first, follow the procedure below and if you need help feel free to contact us. 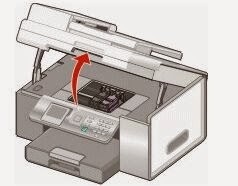 The first thing to do is verify that the printer is turned on, if otherwise connected it to the electric power cord and press the power button, we expect this process finishes on and put at rest. When we lift the scanner section that gives access to cartridges, these are placed in the center of the printer; right in the place where it becomes easy for us to take the ink cartridges, here is where the little hard part begins. When we remove the cartridges latch they will be easier to pull from the car, if you wish to remove both cartridges do the same step twice one for each cartridge as shown in the image. Fill the ink cartridge you can search and fill in this blog, or you can also buy the ink cartridge and use the following procedure to put the ink cartridge in the printer. 1. Uncover the ink cartridge and remove the protective tape and head connectors without contacting the hands of the cartridge electrical contacts. Put the cartridge into the printer and press down so that the latch actives. After putting the cartridge, close while protecting the cartridges latch to avoid paper jams, make a small confirmation that they are tightly closed. Close the door giving access to the cartridges, this is the one stuck with the scanner, do it gently and verify that the hands are not at the time of closing, "you can get hurt" depends on which is your printer, after putting the cartridges this will ask you to put pages, this is to print a test page.